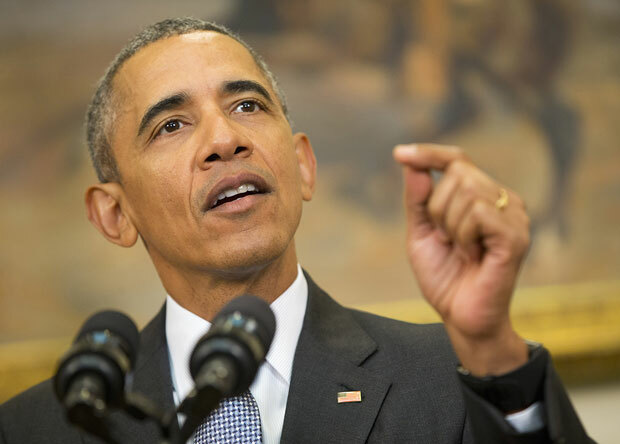 President Barack Obama speaks in the Roosevelt Room of the White House in Washington, Tuesday, Feb. 23, 2016. Obama announced Pentagon’s long-awaited plan to shut down the detention center at Guantanamo Bay, Cuba, and transfer the remaining detainees to a facility in the U.S. The plan is Obamas last-ditch effort to make good on campaign vow to close Guantanamo. WASHINGTON (AP) — President Barack Obama&apos;s plan to close the detention center at Guantanamo Bay, Cuba slammed into a wall of Republican opposition on Tuesday, stopping cold Obama&apos;s hope for a bipartisan effort to "close a chapter" that began in the aftermath of the Sept. 11 attacks. The long-awaited proposal, which was requested by Congress, is Obama&apos;s last attempt to make good on an unfulfilled campaign promise by persuading Congress to change the law that prohibits moving detainees accused of violent extremist acts to U.S. soil. Fourteen years after the facility opened and seven years after Obama took office, the president argued it was "finally" time to shutter a facility that has sparked persistent legal battles, become a recruitment tool for Islamic militants and garnered strong opposition from some allies abroad. "I don&apos;t want to pass this problem onto the next president, whoever it is," Obama said in an appearance at the White House. "If we don&apos;t do what&apos;s required now, I think future generations are going to look back and ask why we failed to act when the right course, the right side of history, and justice and our best American traditions was clear." Despite the big ambitions, Obama&apos;s proposed path remained unclear. The plan leaves unanswered the politically thorny question of where in the U.S a new facility would be located. It offered broad cost estimates. The White House described it as more of a conversation starter than a definitive outline. Republican leaders in Congress showed no interest in having that conversation. "We will review President Obama&apos;s plan but since it includes bringing dangerous terrorists to facilities in U.S. communities, he knows that the bipartisan will of Congress has already been expressed against that proposal," said Senate Majority Leader Mitch McConnell, R-Kentucky. House Speaker Paul Ryan, R-Wis., said Obama had yet to convince Americans that moving detainees to U.S. soil is "smart or safe." "It is against the law — and it will stay against the law," Ryan said. Even Sen. John McCain, R-Ariz., a former prisoner of war and an advocate of closing the prison, called Obama&apos;s report a "vague menu of options," which does not include a policy for dealing with future detainees. Obama has "missed a major chance to convince the Congress and the American people that he has a responsible plan to close the Guantanamo Bay detention facility," he said. It&apos;s not clear whether that chance ever existed. Momentum to close the facility has slowed dramatically under Obama&apos;s tenure. Congress remains deadlocked on far less contentious matters, and the issue has little resonance on the presidential campaign trail. Still, for Obama, the facility stands as painful reminder of the limits on his power: His first executive order sketched out a timeline for closing the prison, but was ultimately derailed by Congress. The White House has not ruled out the possibility that the president may again attempt to close the prison through executive action — a move that would directly challenge Congress&apos; authority. The plan submitted Tuesday does not address that option. Instead, the proposal reflects the administration&apos;s strategy of shrinking the population, hoping the cost of housing the diminished population would ultimately make closure inevitable. Under the plan, roughly 35 of the 91 current detainees will be transferred to other countries in the coming months, leaving up to 60 detainees who are either facing trial by military commission or have been determined to be too dangerous to release but are not facing charges. Those detainees would be relocated to a U.S. facility that could cost up to $475 million to build, but would ultimately be offset by as much as $180 million per year in operating cost savings. The annual operating cost for Guantanamo is $445 million. The U.S. facilities would cost between $265 million and $305 million to operate each year, according to the proposal. The plan considers, but does not name, 13 different locations in the U.S., including seven existing prison facilities in Colorado, South Carolina and Kansas, as well as six other locations at current correctional facilities on state, federal or military sites in several states. It also notes that there could be all new construction on existing military bases. The plan doesn&apos;t recommend a preferred site. Naming a site would have certainly further antagonized some members of Congress. Those representing South Carolina, Kansas and Colorado already have voiced opposition to housing the detainees in their states. Advocates of closing Guantanamo say the prison has long been a recruiting tool for militant groups and that holding extremists suspected of violent acts indefinitely without charges or trial sparks anger and dismay among U.S. allies. Opponents, however, say changing the detention center&apos;s ZIP code won&apos;t eliminate that problem. Obama&apos;s proposal faced criticism even from those who endorse closing the detention center. His initial campaign pledge was widely viewed as a promise to end the practice of detaining prisoners indefinitely without charge, not to bring that practice to the U.S., said Naureen Shah, director of Amnesty International USA&apos;s Security and Human Rights Program. "Whatever the president proposes, even if it doesn&apos;t come to fruition, the administration is changing the goal posts on this issue," she said.